New York, NY : Little, Brown and Co., 2016. 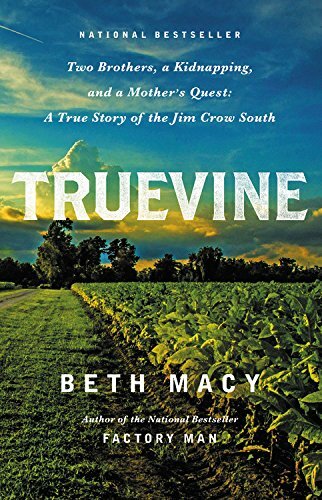 On a sweltering day, in a tobacco field, in Truevine, Virginia, a pair of albino brothers are kidnapped and taken away from home. It is 1899. They were told that their mother had died. It will take twenty-eight years before their mother finds them again. In this true story, we learn what happened to Willie and George Muse on that fateful day. How they were forced to perform as freaks, in a sideshow, in traveling circuses for nearly three decades and ended up being a major attraction in Ringling Brothers and Barnum & Bailey Circus. Truevine is sort of like The Immortal Life of Henrietta Lacks, but with sideshow performers rather than cancer cells. Albino African American brothers George and Willie Muse were born in the Jim Crow South. Their unusual looks (pale white skin with African facial features and dreadlocks) attracted the attention of an unscrupulous promoter, who either kidnapped or recruited them (accounts vary) to leave their home in Truevine, Virginia to travel around the country as circus freaks. They were billed as Eko and Iko, and it was claimed that they were wild men from exotic locations such as Madagascar or Ecuador, or even ambassadors from Mars. The brothers were talented musicians, but they often worked without meaningful pay and were forbidden to speak on stage except for gibberish, leading many to believe that the were cognitively impaired (they weren't). For years they were not permitted to return home even during the off season. In the book's most dramatic scene, George and Willie's washerwoman mother stood up to the "circus men" and racist townspeople to get her sons back. Two albino African-American brothers were stolen from tobacco fields of rural Vairginia in 1899. This is the story of their lives traveling with a circus and being part of a freak show attraction. For 28 years their mother, Harriett Muse tries to find them.......Enjoy reading about all of their struggles, failures and successes.